So with Kona Running Company's last race just completed, I though I would let all of you know that I'll be a race ambassador for them again in 2014. First up is the Kona St. Patrick's Day Run(formerly known as the ShamRocknRoll Run). I'll be doing the Dublin Double. They have 300 spots to run it which is the 10k followed by the 5k. Sweet! I've run this race since it started in 2012 and it's a great way to spend your St. Patrick's Day morning. 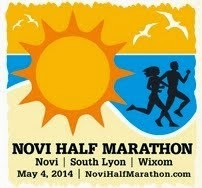 Then next is the Inaugural race of the Novi Half Marathon. A new half marathon in the area is great and I've heard this course is going to be nice(and flat). Next is the Kona Run(formerly known as the Solstice Run). I'll be running the 10 mile option and this will be my fifth year running this great course. If you like a challenge, this is a great race. It's the only race I've done this many times. 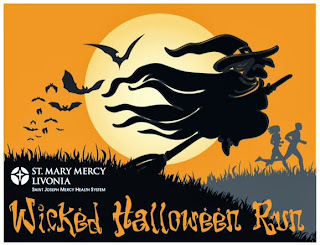 After that, will be the Wicked Halloween Run and I'll opt to run the 10k. It's always a really great time, with cool costumes, and I've run this since it first started in 2011. Finally, I'll run the Kona Chocolate Run 10k to finish out the Kona Grand Slam series. The Inaugural race this year has 6,000 runners! Doing the Kona St. Patrick's Day Run, Kona Run, Wicked Halloween Run and the Kona Chocolate Run(5k or longer) will earn you the Kona Grand Slam medal! Another great finish to the year and you will be able to collect this after the Kona Chocolate Run. So that's the line up for Kona Races next year. I'll be doing race reminders and race reviews throughout the year for all of these races. Are you running any/all of Kona's races in 2014? Which ones? Note: As a race ambassador for Kona Running Company, I receive a complimentary entry into their races in exchange for an honest review of the race. All opinions on this post are my own and I'm not required to give a particular opinion on the race. I think I'm going to try the Kona 10 miler. I ran the Crim this year and it was awesome, so I'd like to try another race that's the same distance. What makes it a challenging course? I'm interested to learn more! Congrats! I am hoping to go for the Grand Slam! World Championship Spartan Race and Giveaway!!!! Christmas Story 5k/10k virtual run changes? Up next - The Monumental Marathon!!! The Road to Indiana - race week!!! !